Mary Potter, OBE was an English painter whose best-known work uses a restrained palette of subtle colours. After studying at the Slade School of Fine Art, Potter began her career, exhibiting in London by the early 1920s. From the 1950s, her work became increasingly abstract, and she gained wider notice. Born Mary Attenborough in Beckenham she upset her parents by choosing painting from her many talents. 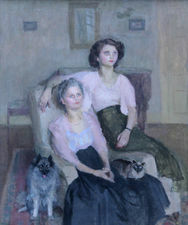 Whilst at the Slade she was awarded first prize for portrait painting and a place in a New English Art Club exhibition. She then decided she was working to a formula and ceremonially burned all her portraits. Mary later married writer Stephen Potter and with two children continued to paint as she wished. It was while living by the Thames in Chiswick from 1927 that she began to dabble with the watery vision which she would explore for the rest of her life. An early member of the London Group Mary Potter also showed allegiance to the Seven and Five Society. In 1951 the Potter family moved to Aldeburgh and it was this Suffolk fishing town that was to provide the inspiration for her finest art. After her divorce in 1955 her great friendship with the founders of the Aldeburgh Festival, Benjamin Britten and Peter Pears led to them swapping houses for six years. So she could paint overlooking the sea from Crag House. During her isolation, with only holiday and occasional visits from artists such as John Piper, Prunella Clough and Sidney Nolan she pared down her vision, thinning her paint, blurring outlines and abolishing the horizon line and painted to ever greater acclaim. Mrs Ronald Simpson and her Daughter Jenny.